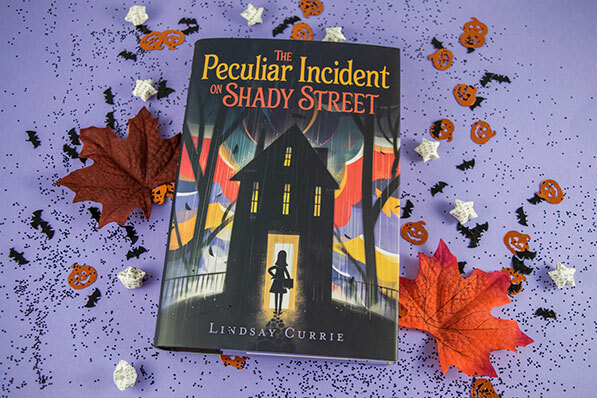 The Peculiar Incident on Shady Street: Interview with Author Lindsay Currie | YAYOMG! With Halloween just a few short weeks away, we know you guys are on the lookout for a good scare. 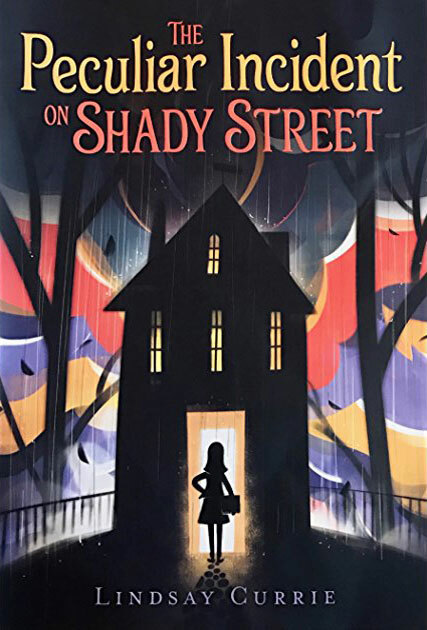 The Peculiar Incident on Shady Street has that covered – complete with a spooky ghost story, a haunted house, and eerie moments that are sure to send a chill down your spine. While it certainly brings the thrills and spooks, Peculiar Incident is so much more than just a scary story. It’s a friendship story. It’s the story of four friends adventuring through Chicago, hunting for clues that will help them solve a centuries-old ghost story. When Tessa’s family moves from their comfortable life in Florida to a new house in Chicago, it’s more than just the change in weather than Tessa has a little trouble adjusting to. Lots of strange things start happening in the house from the very first night they move in. Drawings start appearing in Tessa’s sketchbook. Lights flicker on and off for no reason. Her younger brother Jonah claims that his ventriloquist dummy Reno insists that he’s seen a ghost. Being the new girl in a new school isn’t easy, but it’s even harder when you think your house is haunted. And even harder when you blurt it out in front of the class! Thankfully, classmates Andrew, Nina, and Richie are totally on board for a ghost hunting adventure. A little skeptical at first, these four kids grow into a tight-knit group of friends as they explore their city and unravel the mystery of the haunting. 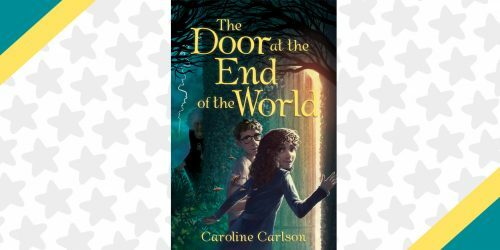 The story is paced perfectly, allowing you to solve the mystery right alongside the kids in the book. 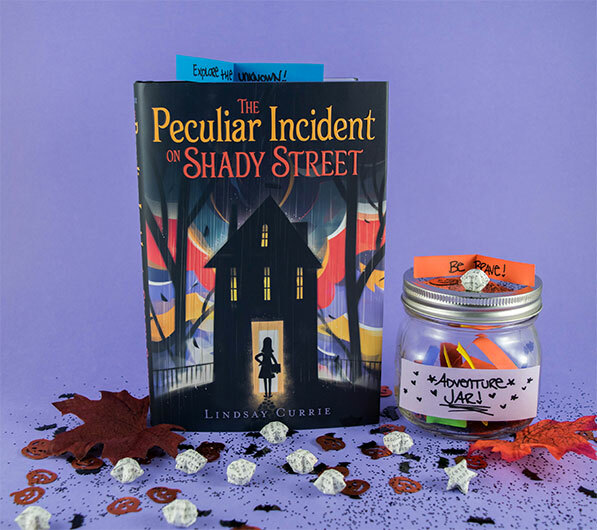 The Peculiar Incident on Shady Street has it all – a ghost story, middle school struggles, being the new kid, and coming to terms with your “embarrassing” family. This fantastic read brings the LOLs, the spooks, and that burning desire to get out and explore the world with your best friends by your side. We chatted with author and horror lover Lindsay Currie. Keep reading below to get to know more about the author and find out even more about what inspired Tessa’s story. YAYOMG! : The haunting in The Peculiar Incident on Shady Street is based on a real-life Chicago ghost story. What made you want to share this particular story with your readers? LINDSAY CURRIE: Truthfully, the ghost legend that inspired PECULIAR INCIDENT has always fascinated me! Partially because the grave itself is so beautifully spooky, but mostly because the story behind this particular ghost has been handed down incorrectly for so many years. It’s almost like that old game “telephone” where you whisper something to the person next to you, and they whisper it to the person next to them. By the time it gets to the end of the line, usually the phrase is completely distorted and bears no resemblance to the original statement. So goes the story with ghost legends. I think readers will be fascinated once they unravel the truth behind this particular ghost story alongside Tessa and her friends! YAYOMG! : We love how Tessa’s friend group is so supportive, welcoming, and fun. (*fingers crossed we see more of their adventures in the future! *) Can you share a little about how her quirky friend group came to life? 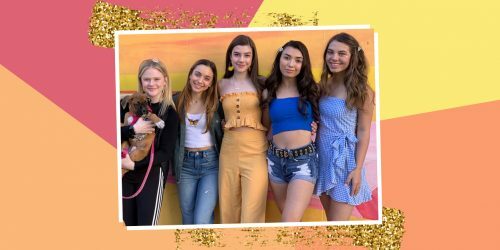 LINDSAY: I’m so glad you like Tessa’s friends! I love them too. ☺ The characters all have bits and pieces of people I’ve known over the years incorporated into their mannerisms – especially my own kids. While I never model characters solely off one person in my life, I do pull quirky elements out of everyone I meet – probably a hazard of being my friend, haha! In the case of PECULIAR INCIDENT, however, these characters formed in my brain very quickly and I loved every moment of writing them. I hope we see more of their adventures in the future, too, because they definitely hold a special place in my heart! YAYOMG! : Tessa’s little brother Jonah has a ventriloquist dummy that never leaves his side. Tell us more about Reno and what inspired you to include him. LINDSAY: Ahhh, yes. Reno. Tessa’s family is what I like to call “perfectly imperfect,” meaning that they have quirks she hasn’t quite grown to appreciate at the outset of the story. Reno is one of them. I love that her younger brother isn’t playing with traditional toys and that he’s learned to see the beauty/value in something old and otherwise considered frightening. Also, confession: I’ve always thought that dolls with moving mouths are scary. My family visits Disney World frequently (I adore it!) and every time we go on the “It’s a Small World” ride, I imagine how I would escape those dolls if the power cut out and we were stranded in the middle of them. I mean, their little moving eyes and mouths are just a wee bit spooky, right? YAYOMG! : What are three adventures we might find inside YOUR adventure jar? -Be brave. This is an important theme in PECULIAR INCIDENT and I hope that if my readers take anything away from Tessa, it’s her strength and resourcefulness! -Try something new. I love that Tessa ultimately learns to explore Chicago with eyes wide open rather than lamenting the loss of everything she loved about Florida. Trying something new isn’t always easy, but sometimes it leads to amazing experiences! -Make a new friend. Not an easy thing to do, for kids or adults, but sometimes it only takes a smile! Andrew is especially good at making new friends. He’s open-minded, kind-hearted and always up for an adventure – even if that adventure sounds more like the beginning of a Goosebumps novel than anything! YAYOMG! : As an author of many creepy, spooky books, we were curious – what is your favorite horror book or movie? LINDSAY: Great question! Well, it’s no secret that I’m partial to ghost stories, so I do love the Paranormal Activity movies. People acting strangely in their sleep and unidentified bumps in the night get me every. Single. Time. And in terms of books, although it isn’t a horror book per-se, I’ve always found Rebecca by Daphne DuMaurier to be especially sinister in tone and setting. YAYOMG! : How do you get in the right mood or mindset to write a scary story? How do you build the atmosphere for a terrifying scene? LINDSAY: I’ll admit to taking a lot of walks in places most folks might find unpleasant. I wander cemeteries, explore “haunted” locales and relish spooky adventures. While researching for PECULIAR INCIDENT, I convinced my husband to go on a date night with me – on a ghost tour bus! It was a blast, and totally put me in the mood to write! YAYOMG! : What is something you’d like your readers to know about you? YAYOMG! 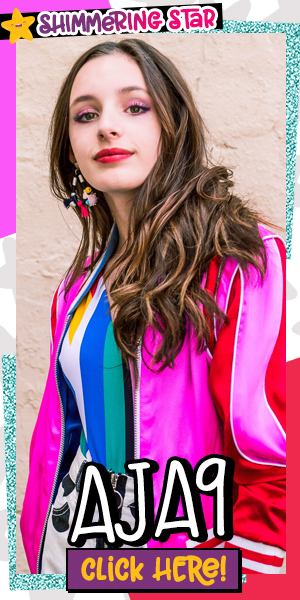 : Do you have any advice for kids who, like Tessa, move away from the school, friends, and familiar places they’ve always known? LINDSAY: Definitely. Remember who you are on the inside moves with you. If you are an athlete in one city, you can be an athlete in another. If you’re strong, resourceful, adventurous . . . all of these things make you who you are and will shine through no matter what city you are living in. It can be hard to move to a new school, and we all know making new friends is really tough, but you can do it. 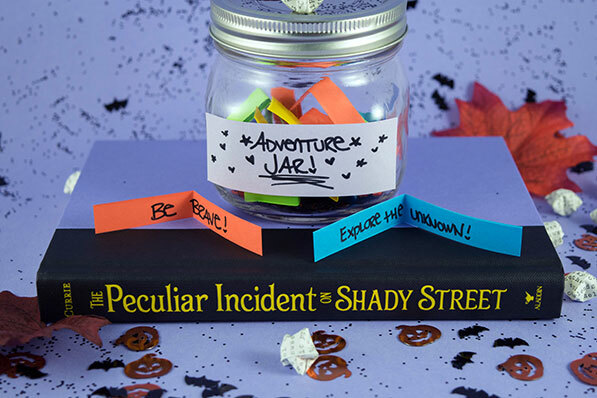 In the book, Tessa’s parents created an adventure jar for her to help encourage her to explore the world around her and break out of her comfort zone. We loved the idea of having an adventure jar, so we made one of our own! You can make one too – it’s super easy! All you need is a jar and a few paper strips. Write down a bunch of adventures, places you’d like to see, or things you’d like to try on the strips and fold them up. Place them all inside the jar. You’re done! It’s that easy. 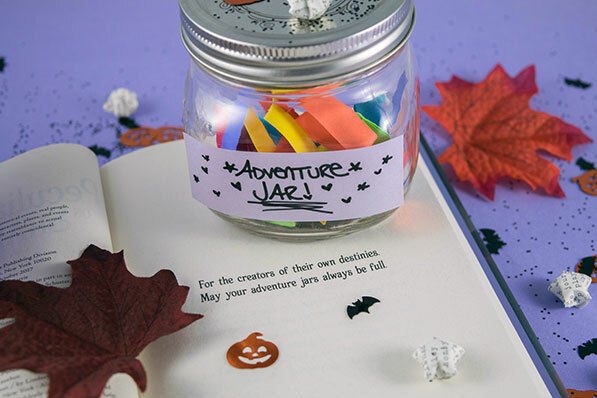 Of course, you can customize your adventure jar further by adding stickers, glitter, or anything to make it more YOU. Even if you’re not feeling crafty, you can still enjoy your new adventures. Use it for days you’re feeling bored or to inspire you and your friends to check out somewhere new rather than the same places you always hang out. -Explore the unknown. This is the adventure that begins Tessa’s adventure, so it definitely deserves a place in your jar. -Talk to a new kid at school. You might just find your new BFF. Or at the very least, make someone’s day. -Try a new hobby. There’s at least one time you’ve thought “I’d love to try that if I had the time.” The time is now – give it a shot! -Read a book from a genre you don’t usually read. 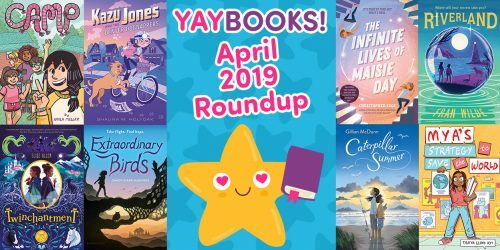 Who knows, you might discover historical or fantasy reads are right up your alley. -Walk a different way home from school. Clear this one with your parents first to be sure it’s safe. But taking a new route home will let you see your neighborhood in a whole new way! -Discover a new food. Try a new vegetable or a style of cuisine you’ve never tasted. -Get creative. Doesn’t matter what you do. Spend at least an hour crafting, drawing, writing, or something else that ignites the creative fire inside you. Filling your jar with a mix of indoor and outdoor activities means you can use the jar in any type of weather. May your adventure jars always be full! The Peculiar Incident on Shady Street is now available, so get to reading! Thanks so much to author Lindsay Currie for taking the time to chat with us – it was a blast! Can’t wait to see what you write next! Get to know more about your favorite authors by checking out our other interviews! We received a copy of this book via NetGalley in exchange for a fair and honest review. We were under no obligation to post a positive review.